Rapid, squeaky, chipping notes in flight. Wings hum. Description: Metallic green above. 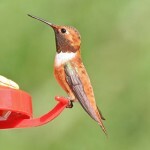 Adult male has brilliant red throat and black chin; whitish underparts; dusky-green sides and flanks; short forked tail. Female lacks red throat; grayish-white underparts with a buffy wash on the sides. Juveniles similar to females, but some males have golden cast on upperparts. 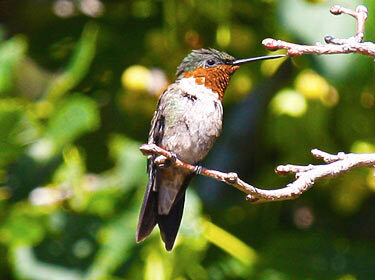 Habitat: Migrants can be seen in city gardens or other areas with nectar-bearing flowers. Breeding done in woodlands, orchards, and parks with large trees, flowering herbs, and shrubs. Where in Nebraska: Uncommon to common spring and fall migrant and summer resident in eastern parts of the state. Breeding occurs along the forested Missouri River valley. Vagrants occur in the west. 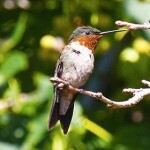 Field Notes: The only hummingbird seen over much of the eastern United States. 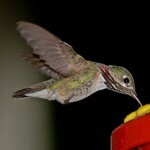 Fun Facts: The Ruby-throated Hummingbird flaps its wings about 53 times a second making it seem like they hover. Sexes appear to migrate separately with males first to arrive and depart.